Charlie Spivak (February 17, 1905 or 1907 – March 1, 1982) was an American trumpeter and bandleader, best known for his big band in the 1940s. 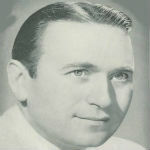 He played with Paul Specht‘s band for most of 1924 to 1930, then spent time with Ben Pollack (1931–1934), the brothers Tommy and Jimmy Dorsey (1934–1935), and Ray Noble (1935– 1936). He played on “Solo Hop” in 1935 by the Glenn Miller Orchestra. He spent 1936 and 1937 mostly working as a studio musician with Gus Arnheim, Glenn Miller, Raymond Scott‘s radio orchestra, and others, followed by periods with Bob Crosby (1938), Tommy Dorsey (1938–1939), and Jack Teagarden (1939). Finally, with the encouragement and financial backing of Glenn Miller, he formed his own band in November 1939. Though it failed within a year, he tried again shortly afterwards, this time taking over the existing band of Bill Downer and making a success of it. Spivak’s band was one of the most successful in the 1940s, and survived until 1959. Spivak’s experience playing with jazz musicians had little effect on his own band’s style, which was straight dance music, made up mainly of ballads and popular tunes.